The Roger Bacon Academy archery team (green shirts) competed next to the New Zealand team (black shirts) in the NASP® World Tournament in Orlando Fl. The RBA team ranked seventh in the world. ORLANDO, FLORIDA: October 10, 2011 – Middle school students from Leland’s Roger Bacon Academy (RBA) were thrilled to meet students from South Africa, Canada and New Zealand. It was also a thrill to compete against them at the National Archery in the Schools Program® (NASP ) World Tournament held in Orlando FL. And compete with them they did, in only their second appearance in the world tournament, the RBA Archery team climbed up to seventh in the world in middle school archery. That’s up seven spots from last year’s fourteenth ranking. “This year was a total team effort, everybody pulled their own weight,” said T.J. Beamer Archery team coach for The Roger Bacon Academy. “And not only did our students compete well, their sportsmanship and conduct away from the competition was outstanding,” he added. 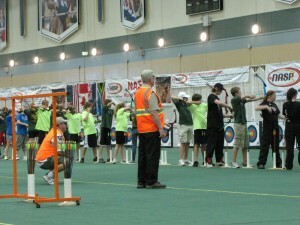 At the National NASP® Tournament in Louisville, KY the archery team, with 21 middle school students, won the right to compete in the NASP® World Tournament. The tournament invites the best competitive archers from around the world in three divisions of competition: elementary, middle school and high school. The RBA middle school team of boys and girls was accompanied by not only team coaches but a myriad of parents and family members as well, taking up a whole section in the stands. “This is a family endeavor,” said Jill Applewhite mother of eighth grade archer Leanne Applewhite. Jill’s husband also attended. “We had a great group of people from RBA here this year supporting these kids and it makes a huge difference. Not only are these students competing on an enormous stage, they are also learning about how to interact with people from around the country and around the world,” she said. 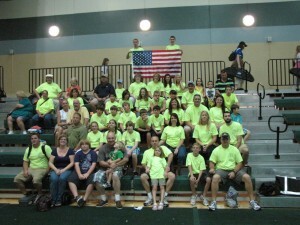 All students must maintain a “c” average or higher to be on the archery team but many are motivated to do even better. “Being on the team and getting to travel for these competitions is a huge motivation for me to do well in my studies,” states Abby Lafave an eighth grade team member. “Archery also helps with patience and focus and that can be carried through to every aspect of life,” the archer and student government president said. 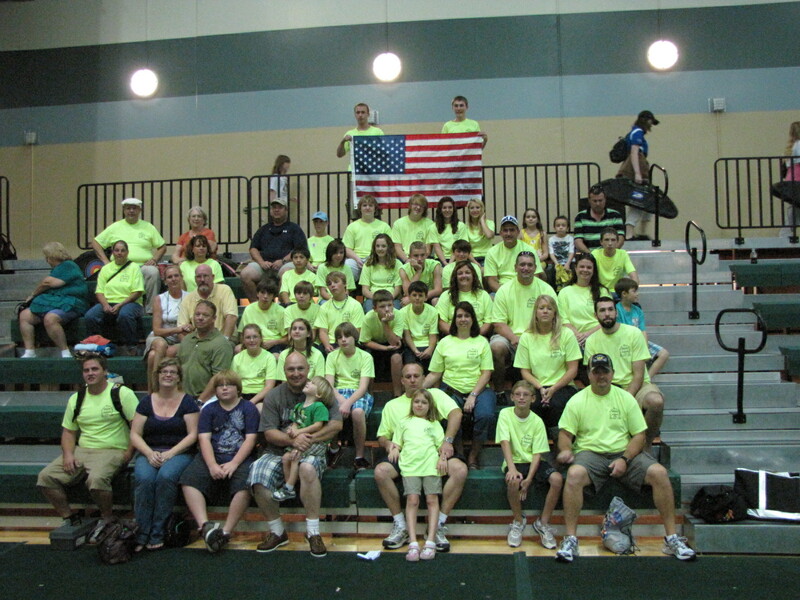 Team RBA Archery fills in a cheering section at the NASP® World Tournament held in Orlando FL last week. The National Archery in the Schools Program® brings the sport of archery to millions of students in schools across the United States. The program is designed to teach International style target archery in physical education classes in the 4th-12th grades. 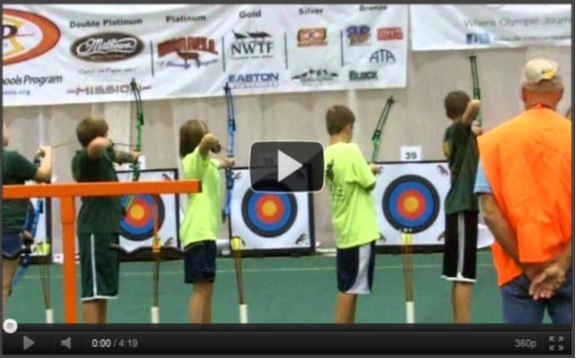 Core content covers archery history, safety, technique, equipment, mental concentration, core strengthening physical fitness and self-improvement. 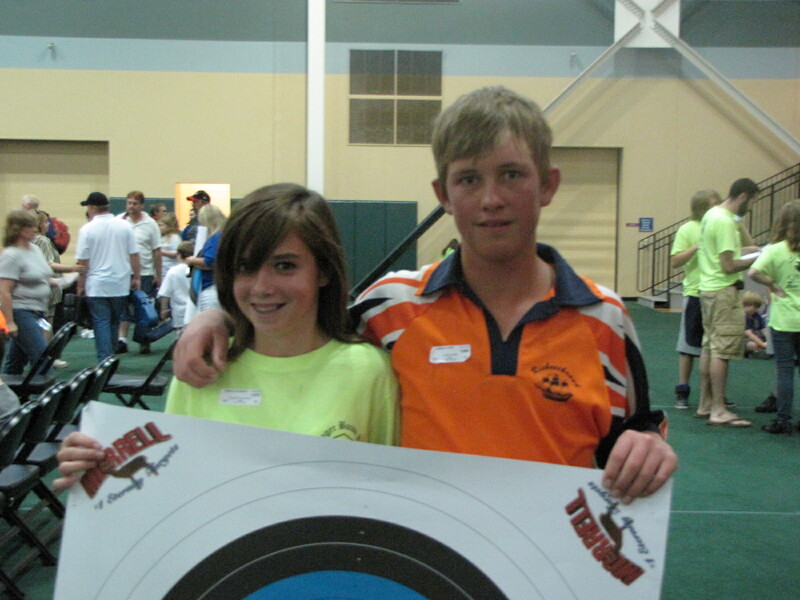 Students shoot at 29 inch bulls-eye targets placed before an arrow curtain in their gymnasium or an outdoor range. Equipment used is state-of-the art and designed to fit every student. The RBA Archery team was sponsored for this trip by Windham Distributing, Quality Deer Management Association (QDMA), The Roger Bacon Academy and Coastal Habitat Conservancy LLC. The Roger Bacon Academy – Charter Day School is a tuition-free, open enrollment K-8 public school in southeastern North Carolina. Since 2000, Charter Day School has focused on quality education and is a premier performance-driven year round school. Widely recognized as a compelling choice to conventional public education the school has built a reputation for retaining dedicated and highly qualified teachers that give students a strong and proven academic foundation. Charter Day School has received numerous awards, including the designation of being a Top-25 School for Academic Growth and of Excellence in the state of North Carolina.